Made for little hands, this set of colorful bells is a perfect first instrument. 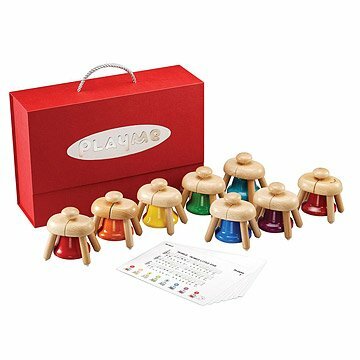 An ideal first instrument for children, these hand bells promote joyous, intuitive music making. Color, coordination, and the basics of music are elegantly allied for multi-sensory learning through play. The set of eight colorful bells is played simply by patting the top buttons through a patented mechanism that produces a single, sustained tone. The set includes: eight bells corresponding to the notes of a C major scale, four large, double-sided song cards with classics like Twinkle Twinkle Little Star, and a handsome storage/carry case. Constructed for strength and beauty, each beechwood and iron bell is a functional work of art that will stand up to a toddler's enthusiastic play. Color-coded diagrams on each song card make set-up a snap. Made in Taiwan. This is a beautiful gift and worth the price!! This is a beautiful and well crafted gift that makes amazing musical sounds! It is well worth the money and comes very nicely packaged which is great for storage. The bells make such a beautiful sound! My niece and nephew twins are 1 1/2 yrs old and absolutely love this! Perfect musical instrument for toddler! The Playme Musical Pat Bells are absolutely perfect for a toddler or young children just starting out playing musical instruments! Each bell is perfectly in tune so he can hit the top of them in any order and it still sounds nice. The bells are metal and each are enclosed in a wooden frame with a knob on top for hitting. The bells are color coded for each note. Sheet music for popular nursery rhymes and songs was also included. My 2 year old loves these bells! an excellent excellent toy. beautiful and solid. Colorful, fun and wonderful ring! Wonderful product. Well made, easy to use and sounds great! This is a gift that my nephew can use for many years. Parents were very pleased.